Outdoor mosquito misting systems zhalt portable: battery powered, uses also natural products and will free your garden from mosquitoes and other insects. 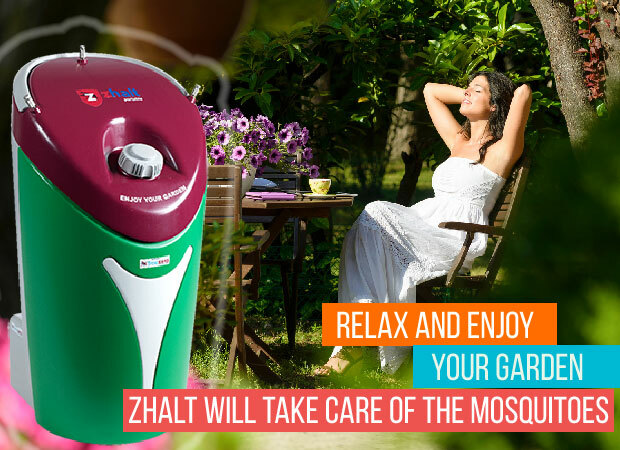 Make the most of your garden, zhalt will take care of the mosquitoes! In your garden, on your terrace at home, whilst camping, on a boat, you can use zhalt where you want! Thanks to its dimensions and powerful battery, you can take zhalt where you want. Even where there is no electricity plug. The capacity of the 8L tank and it's battery function ensure around 20 days of treatment without the need to refill the tank. Zhalt is the only portable mosquito misting system, studied made and produced in Italy. 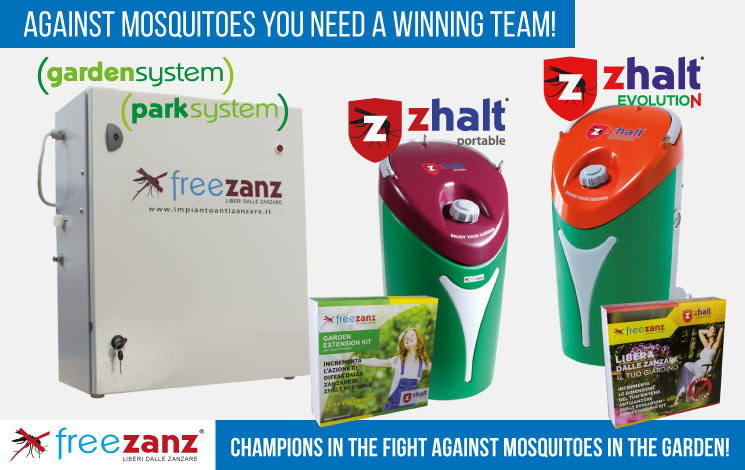 Leaders and experts in the mosquito misting installed systems, freezanz is now offering their first portable mosquito misting system that is battery powered Easy to use and understand, thanks to its battery functions, you won’t have any dangerous electric cables lying around in your garden. You can position if freely where you desire, in your garden, on your terrace, near you gazebo. With its handy remote control you can switch it on or off easily even from inside your house. Please read our easy to follow 'tips on usage' to get maximum results from your zhalt. Do you want to do a barbecue with your family or friends in your garden but you don’t want mosquitoes to ruin your evening? Nothing is easier than zhalt! Around 20-30 minutes before, position it in a central area in your garden near where you plan to be, and use the mist. The action of the product 'Multipurpose Tetrapiu' ensures the area treated approx. 6/8 hours of protection and takes only 3 minutes to apply. (2) (3). 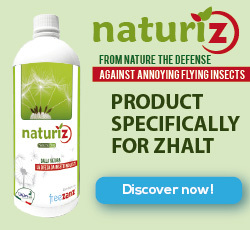 The action of the natural product 'Naturiz' studied specifically for zhalt and other systems of freezanz, ensure a complete and efficient action creating a aromatherapy bubble unpleasant for the insects, that will keep them far away from your treated ambient, leaving you to peacefully enjoy your space. 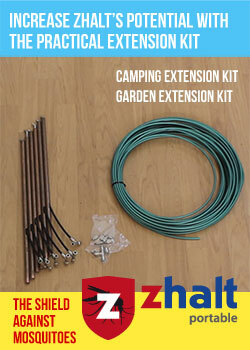 zhalt is able to treat your garden area with a maximum range of 150sqm. If your garden is bigger, you can move it to where you want to cover a larger area. Another option is to buy our Extension kit that will expand the zone giving you a complete misting coverage in your garden. Another solution we recommend for even bigger spaces (medium to large gardens ) is the use of one of our fixed products 'Garden and Park system'. For more information on the benefits of this anti-mosquito misting systems please see in our freezanz Professional line (in italian only) or download our brochure (in english). (1) with a maximum misting cycle of 1 spray duration 3 minutes a day. (2) The levels of the product in the spray "Tetrapiu Multipurpose" are aimed at the treatment of mosquitoes. Misting can vary, based on the type of infestation of mosquitoes and the strength required to treat the zone. (3) "Tetrapiu Multipurpose" is an liquid insecticide ready for use containing synthetic synergized Pyrethroids, aimed for a quick and effective action For use against common mosquitoes, tiger mosquitoes, flies and other flying insects. PMC health register n. 11826.